It's not long now until Christmas and my friends at Us Two Friends have kindly given me a My Friend Cayla Doll to give away to one of my lucky readers. 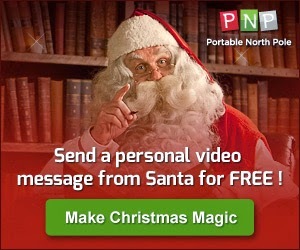 Before I get into the competition I thought it would be nice to share a lovely website I came across about five years ago now called Portable North Pole where you can get a FREE personalised video for your child from Santa. Just by answering a few questions and maybe adding a picture of your little one to make it personal you can create a great video direct from Santa. It's magical and my niece loves receiving hers each year. Here is Lilly's video from Santa this year so you can see the example of the free video you get from Santa. The people behind this site are making so many children happy with their videos. You can also make one for grown ups too! My Friend Cayla is an interactive doll that you can get to know by asking her questions. You can also play games with her and she also tells stories. You can connect to her with a free app on android or IOS. Cayla would make a great Christmas present for a little girl aged 4 or over. To enter the competition just use the gleam widget below and answer the question: What do you or your children want for Christmas this year? A winner will be chosen at random at the end of the competition. The competition is open to residents of the UK only. Good Luck. i would like hmm not sure would have to be something along lines of storage tubs or some cleaning stuff, my daughter is a fan of anything really she loves dolls spiderman arty stuff . My grandson Jake wants some Chuggington trains & who am I to argue with the cutest four year old. I would love a new sewing machine and my kids each have a list as long as my leg! A singing Elsa doll. My daughter not me! dolls for my daughter and spiderman things for my son! the usual computer games...........and a horse! I probably need a new laptop. My daughter's 2, so she's not picky. I think she'd like some toys that allow her to be active. I want a new job, she want's a horse, I think we're both going to be disappointed! Best present would be family fun! I would love a weekend away somewhere quiet! I would love a new laptop. My son would love everything in the Argos catalogue and my baby daughter (11 weeks) is too little to care about Christmas. Lego! I blame Harry Potter. Lego and Monster High dolls! My youngest son wants a fireman Sam ride on,my oldest son wants a new game for his playstation, my youngest daughter wants dolls and my oldest daughter wants a ipod touch. I'd love a new laptop (which isn't going to happen) but I also love really cosy socks and new storage boxes so I can keep on top of the clutter! My Friend Cayla Doll is top of the list! I'd like a Blu-ray player, my granddaughters would like dolls! My son wants an ipad air and my daughter actually wants this doll. a my friend cayla doll. my son wants a playstation 4! My daughter really wants the Cayla doll! Fingers crossed for that! My son is asking for an Xbox one. *Sigh* teenagers are so expensive! My 3 all want bikes this year. The granddaughter's want Barbie dolls and my grandson wants a Xbox. Me? I'd love a pair of fluffy slippers. I'd like a pushchair for our new daughter, & my son would love a crane! I would like a dishwasher. My daughter wants some poodle slippers, they are cute! My 5 year old has asked for Cayla, and my 3 year old would like a transformer! Only a widescreen computer monitor! I'd love a new purse and quilt cover! The top of my daughter's Santa's wish list was a control spider. She might receive it .... if I work out what it is. I want a kitchenaide mixer ( No chance) my daughter wants everything ever made! For me Amazon vouchers for kindle books, aftershave for the OH, teen daughter wants cash & 9 year old son a mountain bike. I'm wanting a few days break to recover from an operation i'm having, my son wants a tv for his bedroom! the cayla doll-and anything-everything frozen! My daughter really wants a Snow Glow Elsa doll, but really struggling as sold out everywhere. Lego, and lots of it. My Daughter wants one of these and a bike! Some birkenstock sandals for me, kids keep changing their minds. Millie would like anything Thomas related, I think Evie would like Waybuloo stuff because she smiles every time she sees Millie's old Yojojo toy or sees the characters on tv. I would like an iPad mini! My niece actually really wants the Cayla doll and we couldn't get it for her as it was sold out. My son really wants Batman Lego! my youngest daughter has just been given her greatest christmas present a full time job!! youngest has asked for a clifforf the big red dog teddy,a torch and a elsa ice skating doll.The boys haven`t asked for anything,yet! skylanders , 3DS XL and pokemon and a smart watch top my kiddos lists ! On my daughter's list are Sylvanian Families, Lego and a Guiness Book of Records. A Rescue Basset Hound as we a dog family. My daughter would love a new Baby Born doll.